Douglas Hyde, Ireland's first president, was born in County Roscommon. Douglas Hyde, born in Roscommon in 1860, was a leading figure in the Gaelic revival and Ireland’s first president. 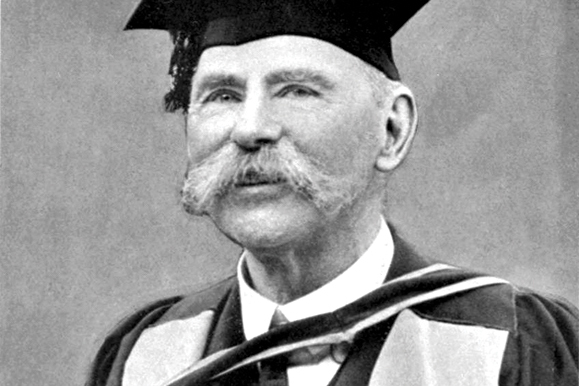 A couple of unplanned events shaped the course of Douglas Hyde’s early life. He should have been born in County Sligo, where his family resided, but instead he arrived on January 17, 1860 in Castlerea, County Roscommon, where his mother was visiting her parents. Seven years later, the family were back in Roscommon, this time in Frenchpark, after his father – the Reverend Arthur Hyde, Jr. – was appointed rector in the parish of Tibohine. With two older brothers away at school, Hyde would have been expected to follow in their footsteps – as was customary for Anglo-Irish gentry at the time – but an illness (some accounts refer to measles; Hyde himself wrote “I hurt my left thigh, and it was a great hindrance to my studying”) saw him return home from Dublin after a very short time. On his return, he continued his schooling at home under his father’s supervision. Statue of Douglas Hyde, Ireland’s first president. By 1880, Hyde himself was a member of said society, and had been admitted to the divinity program at Trinity College Dublin (much to the disgust of his rabidly anti-TCD father). He soon garnered a reputation as an outstanding scholar, and life in Dublin allowed him the freedom to join the Gaelic Union, and a social circle that included Maud Gonne and W.B. Yeats, which styled themselves “the Young Irelanders” in homage to the 1840s revolutionary movement of the same name. Hyde’s father Arthur, himself descended from a long line of clergymen (and Arthurs), assumed that at least one of his sons would follow family tradition and enter the ministry. But Hyde, who had long rebelled against his father’s tendency to force his son to teach Sunday School when the reverend was indisposed (i.e. hungover), instead threw himself into his study of languages and amassed a huge range of scholarly publications, with his studies eventually culminating in a law doctorate. His dedication to the Irish language continued, and between 1879 and 1884 he published hundreds of Irish poems under the pen name “An Craoibhín Aoibhinn” (the charming little branch). A visit to Scotland in 1886 revealed the “healthier and more vigorous” regard the people there had for their native tongue, which he ascribed to its predominant use in churches and schools. In 1889 he published his first book, Leabhar Sgeulaigheachta (A Book of Storytelling), a collection of folk-tales, rhymes, and riddles – the first of its kind in the Irish language. But the Gaelic League, of course, was to prove hugely influential in shaping the course of Irish history, and Hyde along with its other leaders was determined to keep their goal of preserving and reviving the Irish language as non-political and non-sectarian as humanly possible. In 1905, he and his wife embarked on a fund-raising tour of the United States, covering ground from New York to San Francisco over a period of eight months. By 1908, the year in which the National University of Ireland was founded, there were more than 550 branches of the Gaelic League throughout Ireland. After the politicization of the Gaelic League in 1915, Hyde stepped down as president and left the organization. After a short stint in Seanad Eireann, he returned to academia as Professor of Irish at University College Dublin. On retirement, he and his wife returned to live in Frenchpark. A second short stint as a Senator was cut even shorter by his election as the first President of Ireland, on May 6, 1938, after an inter-party unanimous recommendation. Hyde set a precedent by reciting the Presidential Declaration of Office in Irish. His recitation, in Roscommon Irish, is one of a few recordings of a dialect of which Hyde was one of the last speakers. Upon inauguration, he moved into the long-vacant Viceregal Lodge in Phoenix Park, since known as Áras an Uachtaráin. This article was originally published in the December 2017 / January 2018 issue of Irish America. 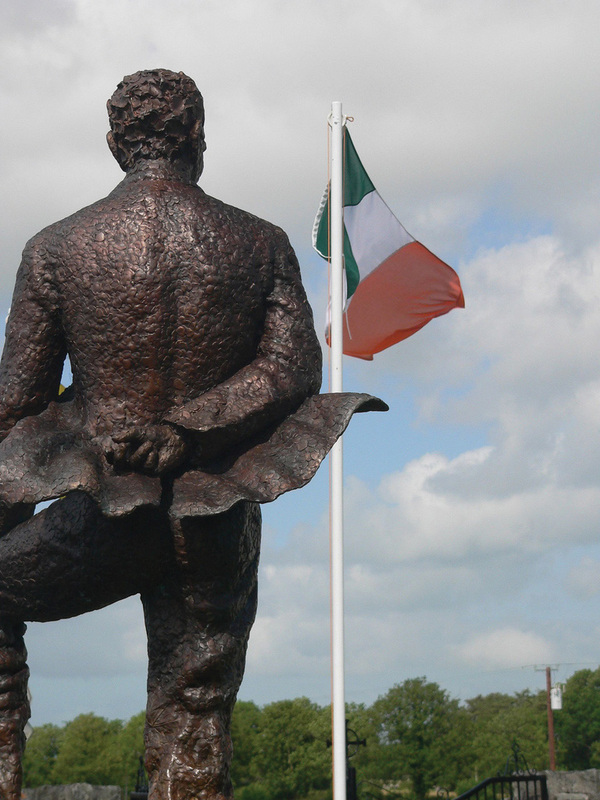 Some would claim John Moore of MooreHall in County Mayo, a leader during the 1798 rising, as first president of Ireland. The inscription on his grave in Castlebar reads: “”Ireland’s first president and a descendant of St Thomas More, who gave his life for his country in the rising of 1798 … By the will of the people exhumed and reinterred here with all honours of church and state.”. His home, in later time the home of his descendent George Moore, is now to be restored by the present Irish govertnment. I seem to recall that in the book, “Story of a Year, 1798” by Tom Postgate, Thomas Moore is mentioned as the President of Connaugh, an independent “state” established with the aid of French forces, but only lasted for 10 days. Gaelgeoir eile ab ba Ernest Blythe, Preispitéarach as Cüige Úladh. One is reminded of another famous Roscommon man, Fr. Edward Flanagan (1886-1948) who founded Boys Town, Nebraska. The U.S postal system this priest 1n 1984 by issuing 4c. stamps with his portrait. .A film was made about this priest, and Spenser played the title role.